My favourite way of noodles. How long it takes to cook depends on how long the noodles take to cook. - Boil water - Chuck in fish balls/meat balls. - Cook noodles in water. 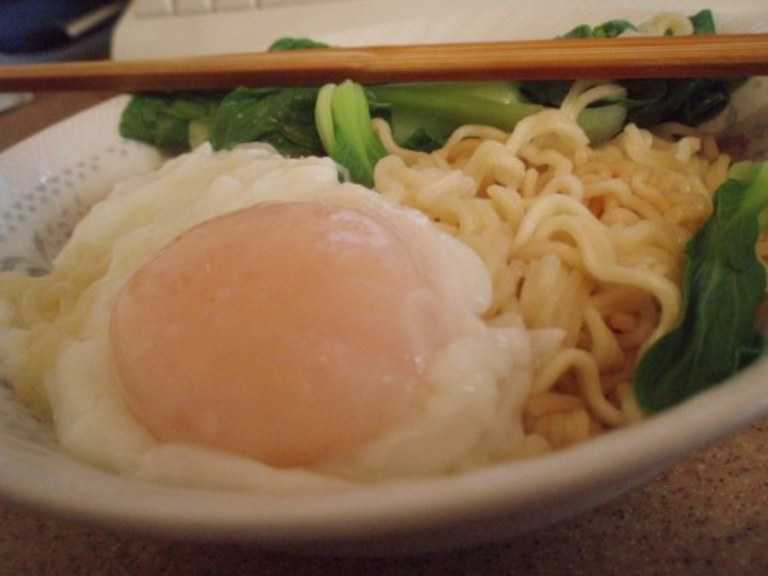 - When noodles are ALMOST cooked, crack the egg ON TOP OF THE NOODLES. You're trying to poach the egg, so don't break it. The noodles act as a "base" so the eggs don't disappear into the sea of starchy noodle water. - Splash boiling water over the egg to cook it slightly, and remove when its JUST cooked, and a bit runny. This should take bout 1 minute or so. - Remove noodles. If you're unlucky and the egg disappears into the sea of starch before you can take it out, just remove the noodles first and search for the egg later, and hope the egg doesn't over cook. - Put vege of choice into still boiling water, and cook until just wilted. Remove fish balls as well. - Chuck all ingrediants into a bowl, and add soy sauce, oyster sauce and sesame oil. Because this is such a simple dish, its best if you get high quality seasoning... it really does effect the taste. - Mix everything up well and eat. I like to slightly break the egg-yolk, and mix it up with the noodles, making it slightly sticky.